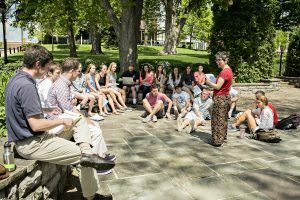 Beginning with the 2018 Spring Term, Washington and Lee will provide institutional grants to meet the full cost of Spring Term domestic and international travel programs for students with financial need. W&L President Will Dudley announced the expanded financial aid program in November, along with an extended deadline to allow eligible students to take advantage of the additional aid now available. Raising endowment to support financial aid for students to study abroad during the academic year, including Spring Term, as well as support travel, guest speakers and other non-traditional activities that are hallmarks of W&L’s revitalized Spring Term, has been an ongoing fundraising priority for Washington and Lee. The president’s discretionary endowment for funding of special initiatives, part of the Johnson Program in Leadership and Integrity, makes it possible for all students to take immediate advantage of Spring Term travel programs as the university focuses on completing this fundraising goal. There will be 17 different Spring Term Abroad programs in 2018. They will be held in Denmark, France, the Netherlands, Japan, England, Ghana, Belize, New Zealand, Scotland, Austria, Switzerland, Spain, and Argentina and Uruguay. Domestic travel courses will include trips to New York, N.Y.; Philadelphia, Pa.; Washington, D.C.; Charlotte, N.C.; South Dakota and the Silicon Valley. For complete details, see the Spring Term website.